Generate conversations with students on a range of topics using the VoiceThread iPad app. VoiceThread conversations give students a voice in the iPad classroom learning process, and improves collaboration, participation, and student engagement. To use VoiceThread, you must create a VoiceThread account. Go to the Register link in the top-right corner of the screen. Sign up for a free account with your e-mail address and password. Once you have a VoiceThread account, you can create VoiceThread slideshows by logging in on the website or by using the VoiceThread app on the iPad. Tap the VoiceThread icon on your iPad to start the app. Tap the Create icon on the bottom toolbar. You’ll get a screen with a large green + symbol. You’ll be prompted with a Library icon to add content from your iPad photo library, and a Camera icon, which will activate the iPad camera so you can take a photo that is added directly to your VoiceThread. Add as many images as you want; each one becomes a slide in your VoiceThread. Add comments by tapping the + balloon on the bottom toolbar. Tap the ABC icon and type text comments. Tap the microphone icon and add audio narration. Tap the camera icon, primp your hair, and talk to the iPad’s webcam. If you’re adding an audio or video comment, you can also “doodle” by tapping the circle icon in the bottom-right corner and drawing on the screen with your finger or a stylus. Doodling is a great way to highlight parts of the slide as you talk. If you are using the VoiceThread Educator account (available through the VoiceThread website), each time a student in your class group shares her VoiceThread with you, it automatically appears in the My Groups section on the home page of the VoiceThread app. At this point, the iPad app only allows sharing via e-mail. For more advanced sharing options, log into your VoiceThread account in the browser on a computer. The basic VoiceThread account is free. You also have the option of upgrading to an Educator account that enables you to add and manage student accounts. Upgrade to a Single Educator account and you can manage up to 50 student accounts. You can also get a School or District VoiceThread subscription. With this upgrade, a central administrator can create teacher and student accounts for everyone in the school. 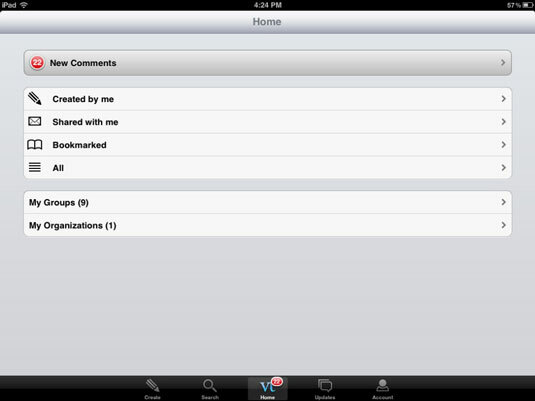 You can then create VoiceThread groups for each class or grade level for easy sharing among groups. To comment on a shared VoiceThread, tap the Home icon on the bottom row for your menu of options and then tap the Shared with Me category. These are all the VoiceThreads that others have shared with you. If commenting has been enabled, you will be able to open the VoiceThread and add your comments to it. If you’re a teacher with an Educator account, all VoiceThreads created by the students in your group are automatically shared with you.